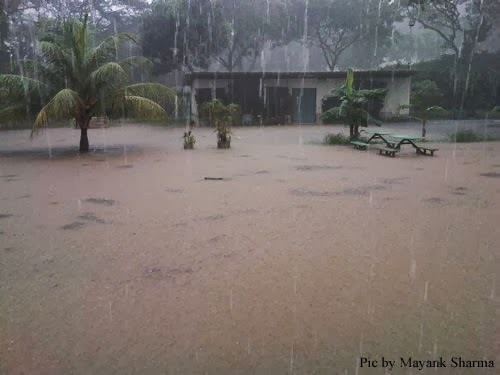 Heavy downpour at late afternoon yesterday resulted in floods in my area. Seeing other parts of the tiny island flooded pales in comparison to flood pictures of your neighboorhood showing up on the internet. 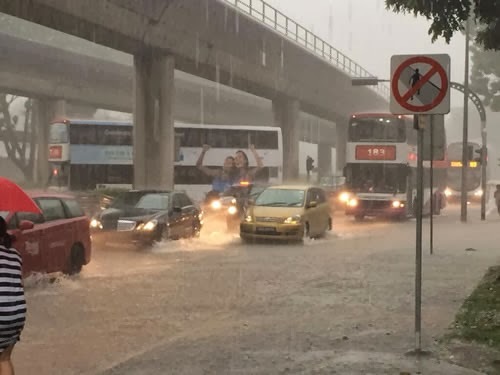 The last time flood pictures of my neighbourhood appeared was almost 2 years ago - Flooding in Clementi After Heavy Rain (blogpost). 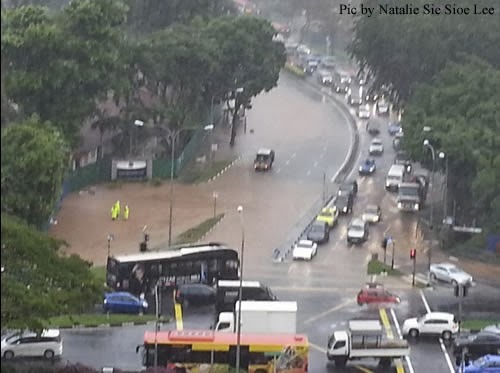 junction of Clementi road & Ulu Pandan road flooded yesterday. The traffic light crossing on the lower right is where i always use to cycle across to reach Ghim Moh track park connector on my way to Queenstown library, Tanglin Halt etc. The Public Utilities Board is doing dredging of the Sungei Ulu Pandan canal. However the drainage at Albert Winsemius Lane, off Sunset Way just literally a stone throw away from the canal couldn't cope. I will post the dredging pictures taken before yesterday's flood in a later blogpost. Flooding at the cross junction beside Clementi Mall. I wonder if the floodwaters flow into the mall's McDonalds fast food restaurant at the ground level which is the mall's closest premises to the water. How do i know is beside Clementi Mall? Elevated train tracks wide apart leading into the train station platforms. I always ride across this cross junction (right to left of pic) for badminton sessions at the sports hall or at Clementi Town school. 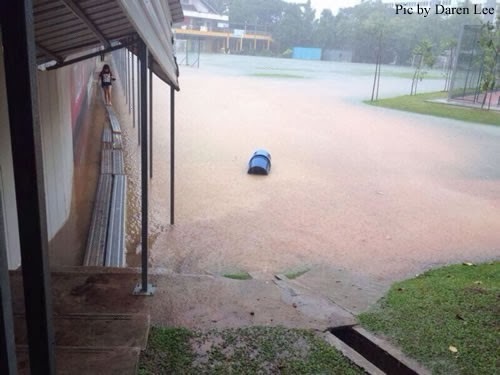 A field in S'pore Polytechnic flooded. It seems like Clementi was chosen yesterday by Mother Nature as the star attraction for rain clouds to unleash the torrent of water. I grew up in Clementi - the weather is changing.